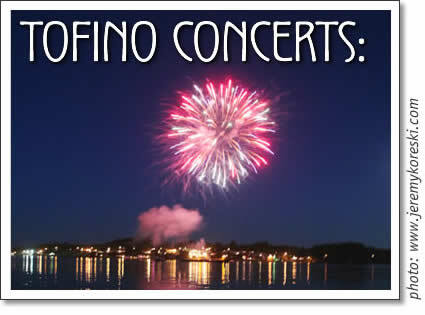 The following concerts are happening in Tofino in the month of May 2006. Tickets are available at Tofitian, Esso and at the Common Loaf. What began in January 2005 as an acoustic trio of three voices and one guitar, has evolved into a charged and dynamic five piece performing post modern indie pop ala avante barbershop. Brother/Sister duo Ryan and Molly Guldemond, and Debra-Jean Creelman front the band as its three vocalists and one guitar player, while Kenton Loewen on drums and Jeremy Page on bass complete this new Vancouver band. Jeremy Walsh's music is best described as groove-driven folk laced with echoes of pop, rock, country and traditional music. He delivers every song with conviction, honesty and a unique musical personality stemming from a wealth of diverse musical and life experience. Traveling with Walsh on this Island Tour is none other than The North American fiddle champion, Ivonne Henandez. Vagabond lullabies, beat-poetry, inner-city blues. These urban minstrels pen harmony drenched melodies to warm your toes. Take the bellow of the blues, the wail of a gypsy fiddle, punk-rock street poetry, a cajun love song, and depression-era jazz, mix it all up and add some old R&B. This music is rich with musical influences, sweetness, grit and soul. These four ladies all sing, write and perform on a stunning array of instruments including banjo, clarinet, slide guitar, piano, accordion, wash-tub bass, violin, and much more. Sweatshop Union is not just a hip hop group with diverse vocal styles and crisp, soulful beats - they are the breath of fresh air that hip hop fans have been waiting for. Originally operating as four independent units (Kyprios, Dirty Circus, Creative Minds, and Innocent Bystanders), the Sweatshop Union Collective came together to offer an alternative to the seemingly repetitive, negative-natured released of rap music. Tracey Saxby still has a little sand in her hair from the beaches of her native Australia, but these days this talented singer/songwriter is using her guitar and voice to warm the cooler, greener scenes of the Northern Hemisphere. Tracey's simple acoustic melodies combine with smooth vocals to create a natural raw sound that is a little rough around the edges. Just a girl and her guitar. Tofino concert schedule for May 2006: Mother, Jeremy Walsh, Po' Girl, Sweatshop Union, and Tracey Saxby in Tofino.